Sidney Slon/Staff Photographer To celebrate the first night of Hanukkah on Sunday, Chabad at Binghamton held a menorah parade and invited students to enjoy music and food. With Hanukkah falling during the last two weeks of the semester, Jewish students at Binghamton University will be spending the holiday away from home this year. Hanukkah, the eight-day Jewish holiday celebrating the victory of the Maccabees against the Syrians in the second century B.C., began on Dec. 2 and will conclude on Dec. 10, a few days before finals are over. To celebrate, Jewish people use a menorah, lighting candles for each night. Families also sing songs and eat jelly doughnuts to celebrate. But for students away from their families and busy preparing for finals, celebrating the holiday can be difficult. Ori Karudo, a senior majoring in computer science, said he was disappointed when he realized he wouldn’t be celebrating Hanukkah with his family this year. 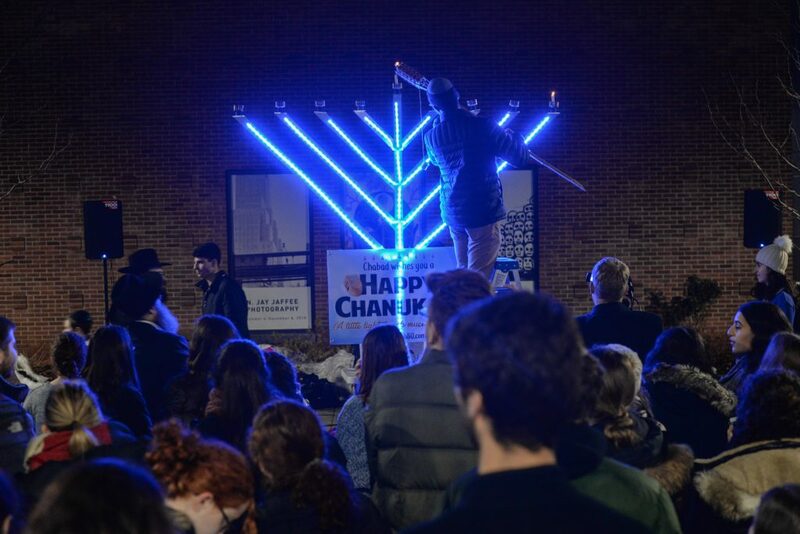 Because of his feelings on celebrating the holiday, Karudo, who is the president of Chabad at Binghamton, helped plan events throughout Hanukkah to encourage students to celebrate the holiday. On the first night of Hanukkah, Chabad held a menorah parade in which cars with menorahs mounted on them drove from Downtown Binghamton to the University campus. On Tuesday, Chabad coordinators hosted various holiday parties in their homes. Rochel Chein, co-director of education at Chabad, hosted a party for freshmen and sophomores and said she wanted to make students feel at home and comfortable despite being on campus. Other Jewish student organizations, such as Hillel, are also holding events throughout the week. On Wednesday, Hillel held its annual Hanukkah party, providing students with food and games to celebrate the holiday. Jennifer Weinstein, a sophomore majoring in business administration, said the events are helping her celebrate away from her family. Although she is upset that she is spending Hanukkah away from home, she is grateful for the different activities and events that are taking place on campus. Chabad is also currently running a Hanukkah toy drive, looking to raise $30,000 in order to provide toys for the kids of Chai Lifeline, an organization that helps kids with illnesses have a happy and normal childhood. Students are also making efforts to virtually connect with their families through FaceTime and Skype, simulating the experience of being home with relatives. Weinstein said she FaceTimed her family on Monday, and Eden Stein, an undeclared freshman, said she has also been calling her parents. Joshua Marcus, a sophomore double-majoring in psychology and political science, said he has come to enjoy celebrating the holiday at the University.